I grew up in the suburbs of Philadelphia. About 20 minutes outside of the City of Brotherly Love. A little off topic, but I thought you’d be interested to know that V.C. Andrews was the first author that I ever read. I devoured her work. What made you go into writing? As a teenager, I was always a storyteller. I’d scare my friends with the things I made up. At 21 I was living in San Diego and met a woman who loved the way I told stories. She said, “Paige, you can either sell cars or be a writer.” I wasn’t sure whether I should be flattered or insulted. So I just giggled and went for the writing gig. Are your books based on true stories? The beginning of my debut novel, Believe Like A Child, is based on truth, but the majority of the story is fiction. Here’s the thing, being abused as a child, I would always imagine that other kids were worse off than me. It was how I was able to cope with my circumstances. I like to base my novels on a child that has to overcome some type of adversity and how that experience shapes their life. I believe that young victims need a voice. My hope is that awareness through fiction will create prevention. In addition, I want to entertain my readers and bring out raw emotion. Your books have a lot of detailed information was it intended that way? Yes, I intentionally write in a detailed manner. I think there is a balance of leaving some of the story to the reader’s imagination and seeing the story through the eyes of the protagonist. I am explicit and graphic so that the reader becomes one with the characters in my stories. There’s a fine balance between good and evil, if I can make you feel that balance, and not just read about it, then I’ve done my job. Did you write When Smiles Fade with the intent of having Emma be a killer or did it evolve as you were writing? I just love Emma. She emerged from her rough childhood as a fighter and was determined not to remain a victim. I will say for all of my stories I always know the beginning and the end before I start writing. Sometimes the ending might vary a little from my original thought. With Emma, I knew exactly what she would become…after all, she lived, breathed and ate violence. Makes you wonder if Mrs. Tisdale had stuck around longer if things would have been different for Emma and Grace…nah, that couldn’t happen, not in one of my novels. When did you come up with the idea to have all the books intertwine? That’s an Interesting question. The idea didn’t really hit me until I was halfway through writing When Smiles Fade. I knew that I wanted all of my characters to be strippers and when I got Emma on that path I thought it would be fun to bring Alessa into the story. Readers adored Alessa (and Lucy) so I was inspired to provide a glimpse back into Alessa’s life. It worked out very well with the first two, which is why Maggie, from One Among Us, also crosses over. What do you say to people who think your writing is too dark? I say this: As much as we hate it, life can be dark, much darker than anything I can create. I think that we all have a morbid curiosity for the subjects I cover in my novels. We want to know, but we don’t want to know. For a lot of children (and adults) my stories are their reality. My goal is to establish a setting in the reader’s mind to feel the horrible things that happen, through the eyes of the victim. Once you are in that place, only then can you take the journey with the characters. I love reading dark stories that can hit me at a visceral level. Can we get a teaser for your next book? You sure can. Let me start by saying this was a different story for me both in genre and gender. It’s the first time I’ve written from a boy’s point of view. I was inspired to write Born Mobster from the encouragement of my readers. Many of them wanted to know the backstory of Tony and Vincent, both characters were in When Smiles Fade and One Among Us. Of course, there couldn’t be Tony and Vincent without Salvatore. I chose Tony to be the main character in Born Mobster because I was more drawn to him. Tony is the gentle giant, the type of bad guy that you love and actually cheer for him to get revenge. I had intended for this book to be a novella, but once I started writing I felt like the story deserved more, so I made it a novel. Born Mobster is due to be released in Fall 2015. Tony Bruno was a seven-year-old boy isolated from the other second graders. Bullied by his classmates and tormented by his father, Tony was alone and hopeless, an outcast among his peers. After years of being bullied, Tony finally takes a stand against Vincent, the worst aggressor in school. In one act of blind courage, Tony shifts the balance of power. A haunting Mafia story where you’ll have to determine if mobsters are made or born. Travel with Tony through his right-of-passage and experience the brutalities, murders and honor that comes with being accepted into this secret society. Born Mobster is a journey of power, love, loss, tragedy and lifetime friendship, but above all else: the Code of Silence. Would you ever write a more “fluffy” mainstream book? [laughing] I don’t see any fluff coming out of me anytime soon. I like to explore the darker side of things and reveal to readers crimes against humanity, the most innocent victims and their journey into adulthood. I just recently started an outline (in my head) of my fifth novel, which is based on a young homeless girl. It definitely won’t be “fluffy”. Are you kidding? It makes me feel great. I’m very flattered when people compare my work to A Child Called It. Dave Pelzer has accomplished so much in his life and in sharing his horrific childhood trauma he has helped many people. I read his story about 15 years ago and I was shocked at all the horrible things his mother had put him through. I hope to someday meet Dave, while my experiences are different than his own, I feel like survivors share an unspoken bond. I would be remiss if I didn’t highlight that the one big difference between our books is that A Child Called It is non-fiction and my books are fiction grounded in reality. Alessa’s book was very emotional for some readers did you know it was going to end that way? Yeah, I did know it was going to end the way it did. 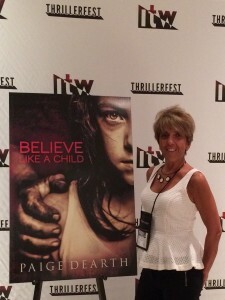 Believe Like A Child is my most beloved work because there is a bigger piece of my personal life in the novel compared to my other books. The ending of the book was Alessa’s destiny. I wanted to have an ending with such an in-your-face twist that the reader is left with their mouth hanging open. I feel like I achieved that goal and was very happy with the ending. Maggie was one of the dolls favorite’s but such a tough subject to read about. Was it hard for you to write? All the subjects I write about are hard, that’s what makes them worth writing about. One Among Us, just like my other two novels was emotionally difficult to write. As an author, in my mind, I literally become each of the characters as I am writing them. I have to feel their pain, horror, happiness, love, bravery, courage and every other emotion to do each of them justice. You may have heard authors use the term method writer, well, that’s what I consider myself to be. If I can’t physically be in the situation I give myself the time to transport my mind into the scenes where my stories take place. I do this to the point where my vision is blurred by my tears (good thing I know the keyboard well). Maggie was a regular kid who came from a loving family. Her mother made one bad decision. All parents make a bad decision at some point…could you imagine? I did, that’s why Maggie Clarke’s story exists. I would like to thank The Dolls Club https://www.facebook.com/thedollsclub?fref=nf for providing me with this interview. You are all such an amazing group of people. I love what you are doing and how much passion all of you have for reading. My true appreciation for your time and my deep gratitude for all of your hard work and devotion to the literary world. Copyrights © 2014 Paige Dearth. All Rights Reserved.